Maybe you’re an architect, and you need to work on some designs you brought home from the office. Or maybe you’re a freelance photographer, and you need to edit the pictures from your last photo shoot. Or maybe you’re working remotely for a startup or a large company. Whatever it is, your career requires a portable computer at home. However, it’s easy to get lost in the tech jargon of other tech sites in your search. So, I have done the research for you. 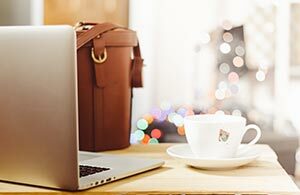 Here are the best laptops for working from home in the simplest language possible! What should you look for in a work laptop? This is the main factor that determines which laptop is best for your job. Processing power determines the speed of a computer when doing different tasks, from web browsing to running Photoshop. More powerful processors will be able to do more high-intensity tasks. The best laptops for photographers and architects have powerful processors, to run programs like Photoshop, Revit, and SketchUp. However, if you’re only writing emails or using Microsoft Word most of the time, then don’t worry about this. Any processor can do those things just fine. When you’re working at home, you’ll often have multiple things open on your computer at once. Social media, news, and maybe music will be in the background while you work. When you’re looking for the best laptop for working from home, then the computer’s ability to multitask is crucial. This is determined by the amount of RAM, or Random Access Memory, it has. More RAM means the computer can do more tasks at the same time. If you’ll be using the laptop for basic tasks (spreadsheets, email) you’ll be OK with 4 GB of RAM. But if you multitask on your computer a lot, going for 8 gigabytes of RAM would be great. The display and graphics of a computer can change your entire experience with it. These aspects are dependent on the graphics card and screen resolution of the laptop. A better video card speeds up the graphics processing speed and a higher-quality screen makes the images and colors crisper and more vibrant. For most people, good displays on a computer screen are just nice additions. However, if you do a lot of work with virtual 3-D models or motion graphics, they are necessary. And for the graphics card, most of us are OK with integrated Intel graphics chip. For working with video, I’d advise going for a dedicated Nvidia GeForce graphics card. I recommend going for GTX 960M if you want the most bang for your buck. The absolute best cards right now are 980, 1060, 1070, 1080. All computers require hard drives to store data on. Faster drives allow for faster data retrieval: computer start-ups, opening applications, and file saves are faster. Hard drives with more space can store more files and install more applications. There are 2 types of drives: HDD and SSD. Basically, SSD is superior to HDD in every way with one major drawback. SSDs cost a lot more. Therefore, if you don’t have an unlimited budget, you might not be able to get a fast SSD to match your needs. For a basic laptop for working from home, a 250 GB SSD is enough. If you don’t have a good reason for a large storage drive, that there’s no reason to spend money on a larger drive. If you’re someone whose job needs a lot of data storage, your laptop’s hard drive needs at least 500 gigabytes (500 GB). The very best laptops have 500 – 1000 GB SSD and optionally with an additional 1000 – 2000 GB HDD. Since you’ll be using this laptop primarily at home, battery life isn’t quite as important. However, if you travel often, the best laptop for working from home needs an efficient battery. The best laptop for travelers should never have anything less than 7 hours of battery life. All right, so you probably have at least some idea of what your laptop needs to have. Here I’ve compiled a list together of the best laptops currently on the market. They’re for a variety of different careers and price ranges, so find the one that’s right for you! If you’re not looking to spend much on your computer, the Acer Convertible Chromebook R11 is the best budget laptop around. It combines functionality with affordability, offering some decent specs for web browsing and text editing. Its best feature is its rotating touchscreen, which can fold backward 360 degrees to turn into a tablet. It also uses the streamlined Chrome OS, an operating system that works entirely through the Google Chrome web browser. Its simplicity makes this Chromebook a good notebook for office work using Google’s online services. Unfortunately, budget laptops always have their restraints, and this one is no exception. In terms of hardware, it can’t handle anything more demanding than a Netflix video before freezing up. Chromebooks are also designed to use exclusively online storage, so it comes with a minuscule 32-gigabyte hard drive. You can’t save anything more than a couple documents and pictures on it. There are also virtually no applications made for Chrome OS. Unless it’ available online, all your work has to be done through Google. Overall, the R11 is a great laptop for a low price, with its shortcomings rooted in its thin hardware optimized for web browsing. If you’re looking to do anything more than text editing and emailing on your laptop, look elsewhere. The best laptop for working from home doesn’t need to just be a laptop. The $500 Spectre X2 is both a powerful laptop and a quality tablet, coming together to make a fantastic combo computer. It’s a great budget notebook for artists and presenters, who need a laptop and a tablet for their work. However, the Spectre still has some noteworthy issues. Compared to other laptop-tablet combinations, it just doesn’t compete. Its processor is slower, it’s far bulkier, and its glossy screen reflects an uncomfortable amount of light. If it’s within your budget to get a better laptop with a detachable screen, you’re best giving this one a pass. If you’re looking for the perfect balance between affordability and power, here it is. One of the latest releases from Asus’ Zenbook line, this machine is the best notebook for office work on the market. With a long battery life and i5 processor, this machine stays lightning fast and reliable whenever you need it. It’s large, gorgeous display and comfortable keyboard make it a joy to use. It’s also only $750, an incredible price for the quality of this laptop. Although it is a phenomenal computer, this laptop is meant for running office programs (like the programs that make up Microsoft Office) and web browsing. If you’re looking for a computer to run Photoshop or other processor-intensive programs, then keep looking. However, if you’re looking for the most reliable and affordable all-around computer for office work, this is the one. Built as an inexpensive gaming and work laptop, the MSI GL62 6QF packs some serious power for an affordable price. Since their hardware is meant for displaying images and models, gaming laptops are great machines for videographers and architects. Some other gaming laptops I think would work well for image-heavy programs can be foundhere. Its quad-core i5 processor and NVIDIA graphics card make it the best budget laptop for image rendering. Despite its incredible power, it costs only $1000, a low price compared to other laptops of its caliber. However, it still has some small shortcomings. The GL62 is a hefty machine, far thicker than other options on the market. It also only has a mediocre five hours of battery life, making it little more than a thinner desktop. If you’re fine with keeping this machine at home most of the time, then this isn’t much of a problem. However, if you want something more portable, you’re better off investing in something else. If you want the best notebook for video and picture editing, get this laptop. The $1290 Dell XPS 13 9350-5341SLV is a gorgeous, portable machine that is deceptively powerful. Boasting an i7 processor, an Iris graphics card, and 250 gigabytes of storage, this laptop can do just about everything you need it to. Photographer with photos? Architect with 3-D designs? Film director with two hours of film footage? Not a problem. It can do it all, and its gorgeous QHD+ touchscreen display makes it an absolute joy to do. The only minor thing to note is its battery life. At just over six hours, it’s all right, but it likely won’t last long trips without a charger. Nevertheless, if you work with photos, film, or digital models, invest in this. While the Dell XPS 13 and MSI GL62 are both excellent computers great at image rendering, this one is the king. The $1500 Zenbook Pro is one of the most powerful machines you’ll find on the market today, outperforming its competitors by significant margins. This is the best laptop for working with from home with video, programming and other computing-intensive work. There are only a few negative aspects that need to be mentioned. The battery life, at only a little over five hours, is rather sub-par for a laptop of this price. Also, its display metrics (brightness, contrast, color coverage) are only slightly above average and do not match the quality you’d expect from MacBook Pro or Dell XPS 15. Still, overall, this is the best laptop for working from home. for $1500. Is this is the best laptop even if you can spend $3000? No. If you want a better battery life, you can go up to ~$2200 and get the best MacBook Pro model or Dell XPS 15 if you’d prefer Windows. At this point, you’re hopefully feeling a bit more confident in what the best laptop for working from home is for you. Don’t worry if you didn’t see any on the list that you liked. Find the one that’s right for you, and be sure to let us know what you do get in the comments! Does Anyone Have Any Suggestions On A Great Laptop That I Could Use For That ?